I haven't even heared of this tart before! What a loss! It is simply gorgeous and I love everything about it. So far this was one of the best recipes I baked being a Daring Baker among the Danish Braid, the Cheesecake pops, the Eclairs and and...I decided to use that last basket of strawberries and cooked a quick jam with some red currants for the tart. Slice strawberries, puree and sieve red currants. Bring it to boil together with the sugar and cook for 1-2 hours depending on the thickness you want to reach. Wonderful! 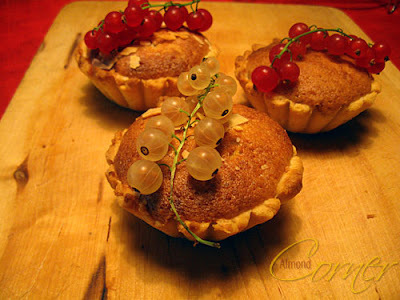 Your tartlets look very pretty, yummy! Yes I totally agree the best recipe so far even better than the cheesecake only because it is much easy. 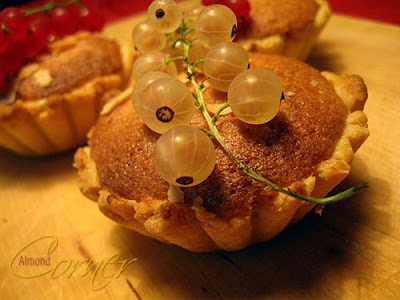 Wonderful looking tarts and I have the berries on top of the tarts. 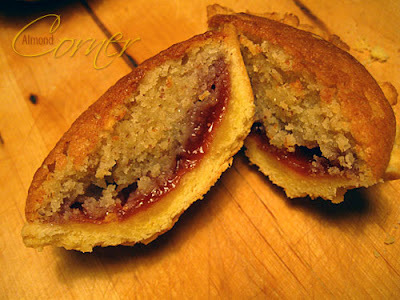 Hmmmm yummy :) Your tarts look great! Cheers. Looks delicious! Your minis are very cute! Nicely done! Your little tartlets look so pretty! I love how you decorated them too. Those currants look so fresh! I love strawberry currant jam, so I can only imagine how delicious your tart was. Nice job on the challenge. Your tart looks great!